Looking for a student room in Hasselt or Diepenbeek? Consult our room database at: www.uhasselt.be/kamers. The landlords in this database make use of the model rental contract drafted by Hasselt University, PXL Academy and UC Leuven-Limburg. If you rent a room advertised in our database, the Student Facilities Office will mediate if there are any problems. It will also provide free fire and personal liability Insurance if you submit a copy of your contract by 31 October. These rooms can be recognised from the street by the sign 'Studentenkamer te huur' (Student room for rent) with the logos of the three institutions. 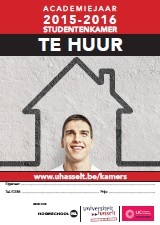 Rent for student accommodation in Hasselt and Diepenbeek is between 200 and 700 euros per month. The average rent for a standard student room is 260 euros. The rent must be paid at a fixed time every month. Before the start of the rental period you will also have to pay a deposit. Most rooms are furnished. However, bedding, towels, cookware and cutlery are not provided, so you will need to bring or buy these things. We've listed a couple of tips for students living out.